Our efforts to implement our Climate Action Plan have been paying off for many years, but a troubling reversal of progress has occurred in recent years. On May 1, 2017, UofL released its 2016 Greenhouse Gas Emissions Report, which documents that UofL’s emissions continue to DECLINE overall, despite an increase documented from 2013 to 2015. UofL reversed that trend and, in 2016, the university was able to achieve an overall reduction of 7.2% in carbon emissions from 2015. By continuing to invest in efficiency and behavior change, we have begun reducing emissions once again. This was a vital investment for the sake of our students’ futures, and, indeed, for our common future on this one shared planet. 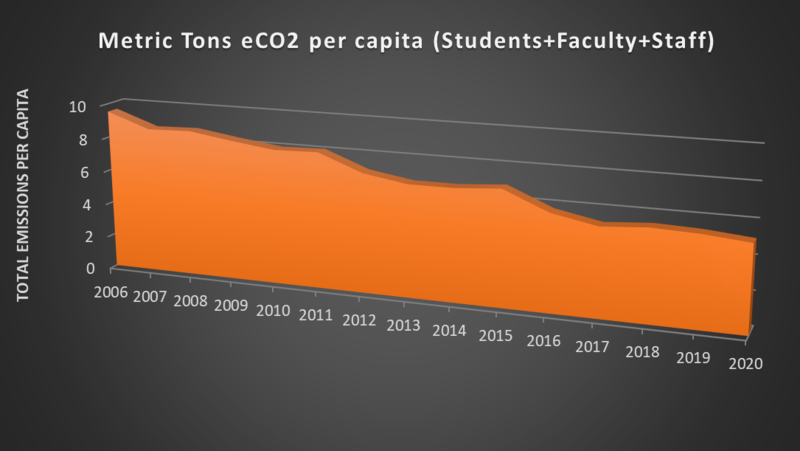 Over the long-term, we have reduced our greenhouse gas (GHG) emissions, even as we continue to grow in terms of physical size, campus population, and budgetary expenditures. From 2006 to 2016, we estimate that UofL’s net carbon emissions have dropped nearly 25% from 236,101 to 177,704 metric tons. Carbon sequestered by 38,656 acres of U.S. forests in one year (or 1,058,312 tree seedlings grown for 10 years). While this reduction is important and laudable, we certainly cannot rest on our laurels. We must remain vigilant, committed, and willing to invest resources in order maintain our progress and to ensure a sustained effort toward our ultimate goal of climate neutrality by 2050. We must continue to invest in emissions reduction, to innovate solutions that work in our unique urban setting, and to prioritize efficiency, behavior change, transportation alternatives and renewable energy. This encouraging news followed the two-year rise in emission documented in our 2015 Greenhouse Gas Emissions Inventory. That bad news, however, came on the heals of a very encouraging 2013 Greenhouse Gas Emissions Inventory, in which we estimated that emissions had already dropped over 22% from 2006 to 2013 (from 246,929 to 191,823 metric tons of carbon dioxide equivalent emitted annually, an amount equal to taking 11,600 cars off the road).